Last week we discussed the mechanics and reasoning behind what constitutes an Ultimate Handover at the front office in your Dental Office. The Ultimate Handover is the process of transferal of the treated patient to the Front Office Person by the Dental Assistant, following the completion of their dental treatment. One of the most important things we teach at The Ultimate Patient Experience is the importance of making sure that the client is included in the process in the front desk Ultimate Handover. The important and crucial element of this process is to be factual AND personal in the transfer of information from the Dental Assistant to the Front Office Person. The operation is a process of introduction and handover, much in the same way we would introduce a new friend to a group of our long-term friends at a cocktail party. We must never talk “about” the patient. We must always talk *with* the patient, always including the patient in the conversation. “Hello Helen, today for Mrs. Smith Dr Moffet removed active decay from three teeth, 14, 15 and 16, and restored those teeth with three large and extensive composite resin fillings. Now two of those cavities, on 14 and 15, were quite deep, getting down near the nerve. Dr Moffet has warned Mrs. Smith that there maybe nerve damage as a result of this decay, and the depth of the filings. All of this information from the Dental Assistant to the Front Office Person is framed to be conversational as well as factual, always speaking about the patient by using their name, not he or she, and with the Front Office Person looking to the patient at each instance for verbal confirmation and visual recognition that the processes and procedures being spoken of are confirmed and understood by the patient. This stage of The Ultimate Patient Experience is not the drop off of the family pooch to the boarding kennel. This is the personable transfer of a dear friend from one conversation to another. Time must be taken with the transfer of the patient. It is essential to be making sure they are engaged and included in the conversation and transfer, talking and nodding with them rather than talking about them, sometimes as if they aren’t even present. When the patient or client is included in the conversation then the chances of treatment plan acceptance are increased dramatically. Everyone likes dealing with friends, and with friendly people. It is just so much more enjoyable than being treated as invisible, or as a number. Talking Too Much Is Costing You Big Time – Are You a Good Listener? As I write this blog I’m on a coach/bus travelling from Dublin to Lahinch. A friend and I have been travelling around Northern Ireland playing golf for a week, and now we’ve just joined an organised tour for a second week of golf with forty other golfers. It’s 9:45am and the bus has its wipers on. This is the first rain we’ve really seen on the trip, after nine games of golf. And we still have seven more to go. As the bus heads west the weather does not look good. The bus trip has been, well, interesting. It’s given me a greater insight into some of the different types of people there are in the world. Firstly, we’re sitting at a table of four on the coach. I’ve had to get the iPod Shuffle out in an effort to try to drown out the prattle of our Irish coach driver who is very fond of his own voice. Overly fond. I’m not sure anyone is listening to him. But he’s still talking, talking, and talking….. In our group of four, there seems to be one talker, and three listeners. Again, some people seem very fond of their own voice. Overly fond, again. Now, I’ve found, over time, that it’s easier to learn more when you’re listening rather than when you’re talking. And this is the same at the dental office. Firstly, if you’re not listening to your patients, how the heck can you ever expect to understand them? Or understand them fully? How can you really ever know all of their needs and their wants, if you yourself have always got your own mouth open? How can you know exactly what your patients want if you’re always talking on and on yourself? Ask yourself this? Are you the kind of dentist who likes to prattle on for long lengths of time, about techniques and features, rather than discuss benefits as needed? Because it’s benefits your patients want to hear about, not features! If you don’t dig deep into your patients needs and wants with questions, then how the heck can you solve their problems? If you’re always listening to the sound of your own voice, then how will you know, I mean really know, your patient’s real concerns? This is the case of the bus driver. In the group of four, some people like to be the centre of attention. Again, these people seem to have an opinion on everything, and they need to have that opinion heard by everyone too. The listener type, however, is far more interesting. They sift through the information they hear, adding appropriately, where needed, appearing interested and knowledgeable. This is how you should be with your patients. Become fact collectors. Gather information. Add your own two cents worth pertinently, where needed. Mastering the art of active listening, rather than lecturing, will help you become a respected friend of your patients, rather than a knowledgeable lecturer. When its time for them to have and accept treatment, they’ll be more likely to accept your proposed treatment plan, if you’ve been a problem solving, active listening friend, rather than a headmaster type. You’ll find your business, *the* business of dentistry, will become easier, when you are a good listener, rather than a lecturer. After all, that’s why we have two ears and one mouth, isn’t it? Three Huge Mistakes You May Not Know You Are Making – How is Your Handover? One of the crucial stages in the Cycles of the Ultimate Patient Experience is the Handover of the Patient from the Dental Chairside Assistant to the Front Office Person responsible for the check out of the patient. The purpose of the Handover is to communicate clearly and precisely to the Front Office Person *ALL* the correct and essential information that the Front Office Person requires to allow them to complete the Perfect Ultimate Patient Check Out and the Ultimate Post-appointment Building Block. Laid over the top of the necessary information that needs to be transferred is the necessity of making sure that the transfer of information maintains the familiarity of a conversation *involving* the patient as opposed to a discussion “about” the patient or worse still, become a dialogue *only* between the two team members with the patient present but being treated as if they were invisible. The results of a poor handover are that the Front Office Person does not have all the information they need to ensure that the patient is appointed clearly to the *Clear Next Step* that they need to take in their journey to dental health. Without the correct information, the Front Office Person does not have all the resources required to correctly direct the patient’s dental journey. Without that information, the Front Office Person sometimes has to guess exactly what the patient’s next step will be. Sometimes the Front Office Person has to ask the patient. This can be awkward, as the patient may not remember what is needed or the patient may be unsure as to whether they want or need to proceed with the required diagnosed and presented treatment. This creates an element of indecision for the patient. If the Front Office Person is unsure of exactly what is required, then the patient too becomes undecided as to what their next step should be. The Front Office Person relies on receiving all the information they need from the Dental Assistant. It is the duty of the Dental Assistant to provide the Front Office Person with all of that information. It is the role of the Dental Assistant to know exactly all of the information the Front Office Person requires to ensure that Clear Next Step for the departing patient. It is the role and the duty of the Dental Assistant to ensure that she collects all this information during the treatment appointment of the patient, and from the dentist at the completion of the treatment. A great Dental Assistant knows the importance of her duty in this process. Her ability to transfer this information seamlessly to the Front Office Person ensures that the patient happily continues with their necessary appointments to continue on their road to dental health. Touching lightly on this process, but just as important, is the role of the dentist in transferring information to the Dental Assistant, along with ensuring that the patient understands exactly what treatment they just had completed, and what treatment they will be having at their next and subsequent dental appointments. We’ll discuss the intricacies of this handover from the dentist to the Dental Assistant at the completion of the treatment stage in future blogs. What are the consequences of a poor hand over to the dental Front Office Person? Simply put, patients will be leaving the dental office without appointments to get all their diagnosed treatment completed. This means patients with dental liabilities roaming around in the community. Dental liabilities only rear themselves later on as dental emergencies or dental relief of pain. The patient is never a winner in this situation. Failure to ensure the diagnosed treatment is accepted and booked and completed is a lose-lose for the patient. It is also a lose-lose for the dental office. It creates a patient with a time bomb situation needing future emergency treatment for work not scheduled that should have been scheduled, but wasn’t scheduled because of careless processes and procedures and protocols. It is also work that should have been completed and paid for to the dental office. Completion of all diagnosed treatment ensures a financially healthy dental office and a healthy and happy work environment. What can be the reasons for a poor handover from the Dental Assistant? You either have an employee dedicated to the process of providing ultimate patient experiences and exceptional customer service, or you don’t. If they are dedicated to the process, then they need to have the back up recourses within the dental office to support them as they provide the ultimate handover. First of all, the Ultimate Handover requires time. The Dental Assistant needs to spend time handing over. She cannot be abbreviating the process because she feels she has to rush away to other duties. All other duties need to wait. The handover, and the patient, are the most important at this point in time. Nothing else matters or rates. For this to happen, the dental office needs to be sufficiently staffed so that treatment rooms can be torn down and set up independent of the handover. Better still, sufficient staff and also sufficient available treatment rooms allows for the handover to happen without distraction. The benefits of having a perfect handover are clear and definite. Not providing the staffing, time and resources to allow for the perfect handover are harming your dental practice, your patients, and their necessary treatment. The choice is yours…are you making the right choices? In a previous blog I mentioned a list of some of the things they don’t teach you in Dental School that they should. 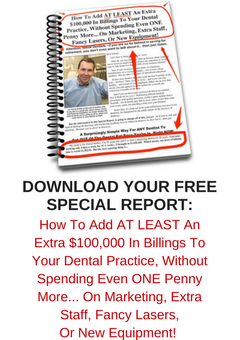 Today I’d like to discuss one of the major pitfalls of dentistry that some dentists fall into…and that is the chasing of big shiny objects. Top of the list for Big Shiny Objects is a swish new or new looking Dental Office Facility filled with fancy new Equipment. As I travel around Australia and North America I see a lot of dentists, new and old, spending truckloads of cash building Taj Mahals and mausoleums and shrines to themselves, full of lavish fittings and fixtures, then chasing after the latest in gadgetry and toys to fill their dental shrines with. This can be very expensive and very costly as well. Expensive in set up costs alone. Costly in chewing up big dollars over and over and over through expensive long term financing. Now don’t get me wrong. If you’re dental office is growing, then it’s a fact of life that you as a dentist will need to go through a fit out or refit at some point in your ownership of your dental practice. If you’re setting up a new office or you’re upgrading an old facility or relocating, then a fit out, or new fit out can seem very attractive. But the world of dental fit out is a very lucrative business for the fitter outerer. Frankly, I’m surprised at the going rate for fit outs. Having built a whole brand new house years ago, with stairs and carpets and kitchens and bathrooms, I have an idea of what you can get for your fit out buck. Yet time and time again I’ve seen dentists and dental offices being coerced into fit outs that are simply outrageous when you look at the costings and compare them to the cost of a house on a dollar per square foot basis. I know who is laughing all the way to the bank, and it’s not the dentist. So let’s look at some simple principles in dental office design. And we’ll start where it all really matters, where the wheels are turning, in the treatment rooms. Now in some offices I’ve visited I’ve seen wall to wall cupboards and drawers and shelves and fixtures and goodness knows what!! Looking way too busy, busy, busy! Sometimes it looks good, but frankly, cupboards and draws just fill up with junk. They become magnets for hidden clutter. Hidey holes for unused junk that should be gone. You need a mobile cart, for the dental assistants to wheel close, to save stretching. Everything they need should be in those carts. But nothing they don’t need. Doc has a PC on a mobile trolley [from Officeworks] on his side. TV/monitor on the wall in front of the patient. TV/monitor on the ceiling above patient. This one acts as a visual distraction during treatment, and can also can be switched from TV to duplicate monitor screen so the doc can explain x-rays etc. to the patient without them having to crane their neck. Treatment room has plenty of available floor room for doc to move and sit beside and in front of patient to make level eye-to-eye contact in a relaxed manner. You see, I believe that small treatment rooms look mean. They look cheap and nasty. With space comes the feeling of freedom, not of claustrophobia. And claustrophobia may actually inhibit the patient’s desire to purchase. Cutting down and reducing the costs of cabinetry and clutter holes in your dental office can remove inhibitive overhead from your fit out and ongoing costs. Freeing up space and the feeling of space, and freeing up cash and income and profit moving forward. So when designing your treatment rooms, keep it simple. Sleek. Remember, less can be more…. Last November I had the honour of sharing the stage at the DiJulius Group’s Secret Service Summit in Cleveland with Rory Vaden, author of the best-selling book, “Take the Stairs”. This week in his blog, “It’s Hard to Be Nervous When Your Mind is On Service”, Rory really nails it when he talks about the act of Customer Service being about serving people rather than selling to people. When you think about this, you really realize that this is exactly what we all want as customers and it is exactly what we must do for and to our own customers. In life though, we have more than customers. As such, the people who we deal with also need to be served. This includes our children, our loved ones, our family members and our friends. We must always be treating them exactly as we would want to be treated ourselves. Take a look at how you treat your patients and clients and customers. Are you treating them the same way that you would want to be treated? Are you courteous to them, or are you rushing them? Do you speak to your patients like you are lecturing a school student, or do you ask questions, courteously, trying to determine the reason for their behaviors, so that you might then understand them before trying to correct and improve their behaviors. Are you making the transaction process as friendly and courteous as possible, so that it is a pleasure doing business with your office? Or are you rushing your customers at this end of the appointment, taking their money with haste, and leaving a nasty impression of your office as their last departing memory? The Dental Customer Experience Cycle, as explained in The Ultimate Patient Experience, should be such a pleasure for the patient to experience that the doing of the dentistry is secondary to the world-class customer service that they experience at your place of business. When they say this, you know that the dentistry is just part of the process, not all of the process. You know that if you are providing World Class Customer Service, then it makes it far more difficult for your patients to stop doing business with your office, because they have a relationship, a friendship, with your people. The providing of World Class Customer Service at your office to your valued patients, clients and customers, also allows you to charge a little more for your services than your competitors, because the service is certainly so worth it!! So how is the Culture at your Dental Office? Are you providing a total World Class Customer Experience for your valued, clients, patients and customers? Because if you are not, if you are only partly doing it, then you’re doing it wrong, as they say in the classics. And if you’re doing it wrong, you need to call me! !